If you're looking for an easy home-made Valentine's Day gift, then these Dairy Free Peanut Butter Pretzel Chocolate Hearts could be just the thing. I found this fun recipe at One Frugal Foodie, and wanted to share it with you as I love the simplicity of them, and by just reading the name you know they are going to be delicious! If you don't have someone to share these with then just do as I do and eat them all yourself! In a large bowl, combine the peanut butter, margarine, and vanilla. Sift the powdered sugar and salt, and mix. The dough needs to be somewhat stiff and easy to shape, but if it is too stiff add 1 tablespoon of milk alternative, or more as needed. If it is actually too sticky, pop it into the fridge to chill for 30 minutes or so. Melt the chocolate chips in a bowl. Start with half of them and melt more as needed. Roll a small ball of the peanut butter mixture, place it on top of a pretzel, and smash it down with another pretzel, making sure to line the two pretzels up. If desired, fill in with additional peanut butter, and add some shape. Dip the peanut butter pretzels in the chocolate, ensuring that they are coated. Lift them out with a fork, tapping the fork several times on the bowl to smooth the chocolate a bit and get rid of excess chocolate. Place them on a wax paper lined baking sheet, and pop them in the freezer for about 15 minutes to chill and harden. Store in the fridge. 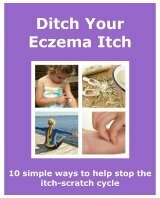 Advertising on What Is Eczema?